Part of that perception of the Genesis Coupe as something special comes from the four creases in the hood and the way the blend into the nose. 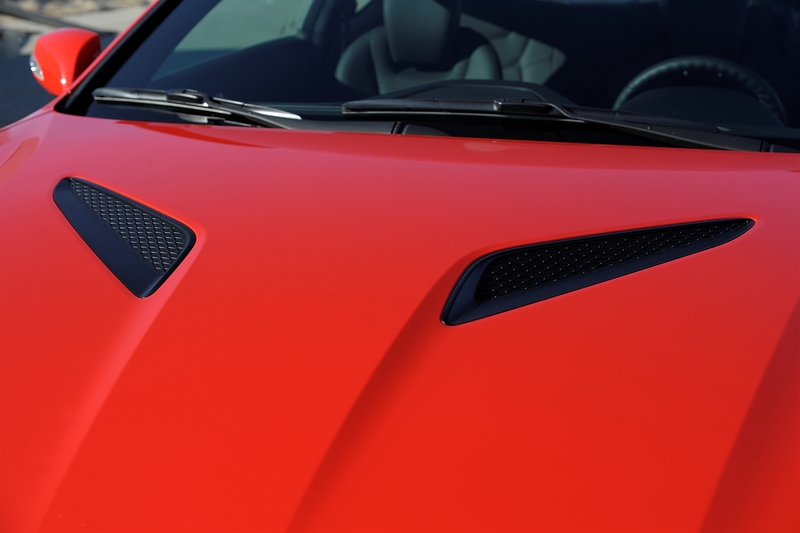 Helping are two angular air scoops (fake, sadly) that perfectly accent the hood’s lines too. Not so subtle creasing of the sheet metal along the sides also makes Genesis look quick, even sitting still. The funny part (although maybe not to other automakers), is that the Hyundai is a fun and fashionable coupe at a modest price. The base 2.0T with manual transmission begins at $24,250 and the tested 2.0T Premium with leather trimmed seats and such, lists at $28,750, but needed no options added, just an $875 delivery fee to hit $29,625. For some prospective sports coupe buyers the Genesis’s shape will be enough to lure them into a showroom, but there’s more to turn heads. For instance, even the base model packs a 2.0-liter I4 with variable valve timing and a twin-scroll turbocharger to give it some oomph. Using regular gas it creates 260 horses and with premium fuel will deliver 274 hp. 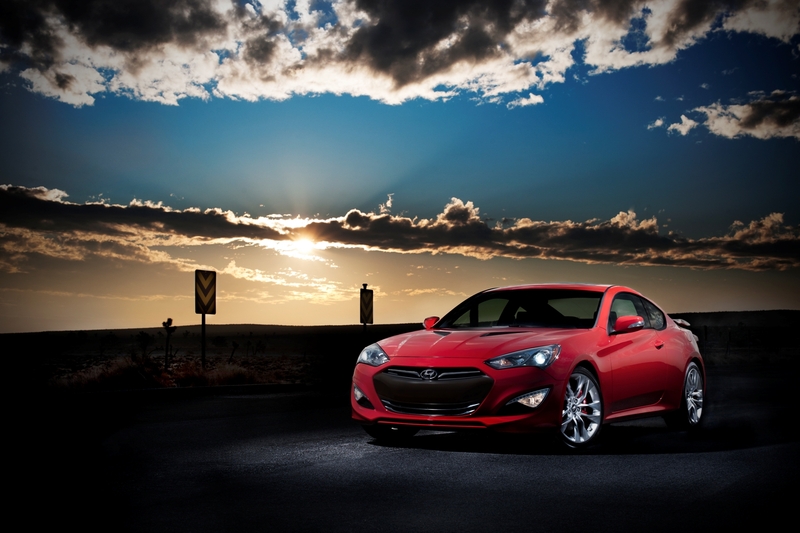 Ripping up or down a highway entry ramp is where the Genesis really excels as the turbo gives a real burst of speed. However, that turbo is late coming to the party at city speeds. You’ll rarely feel it helping as you pull away from a stoplight unless you accelerate aggressively. Folks wanting low-end grunt to go with high-end muscle may want to consider a V6-equipped model with 344 horses. The 3.8L Grand Touring is next up from the test car and starts at $31,828. These air scoops look stylish, but they’re fake. Part of the reason for the mild acceleration is Hyundai’s new 8-speed automatic that seems unsure of which gear to select sometimes, and it shifts way too often, but that’s by design. It’s supposed to boost fuel economy and create seamless shifts in most cars. Here it’s a bit fickle. Better to use the large paddle shifters behind the steering wheel when you want to controls shift points and boost power. Handling is sporty in that it’s easy to put the coupe into a turn at speed and come out the other side with no body lean and little in the way of push from the rear-drive Hyundai. Steering effort is another matter. Hyundai needs to work harder on this part of its game. The effort here feels artificially heavy, almost like you’re driving a large, 4,000-5,000-lb. sedan or crossover. My mind raced back to our stiff-steering 1969 Olds Cutlass S when I first tried turning this wheel. Yet in reality the Genesis weighs just 3,425 lbs., so not a heavyweight. At slow speeds the steering effort is particularly heavy and the coupe’s slick leather steering wheel cover is not much help either. This needs more texture for improved grip. Ride from the four-wheel independent suspension is better than most coupes. Thank a 111-inch wheelbase and Hyundai’s five-link rear suspension for eating up our rough roads and keeping the car from suffering severe rump thumps. Up front you’ll also find a sport suspension with shock tower braces to cut flex and improve ride and handling. 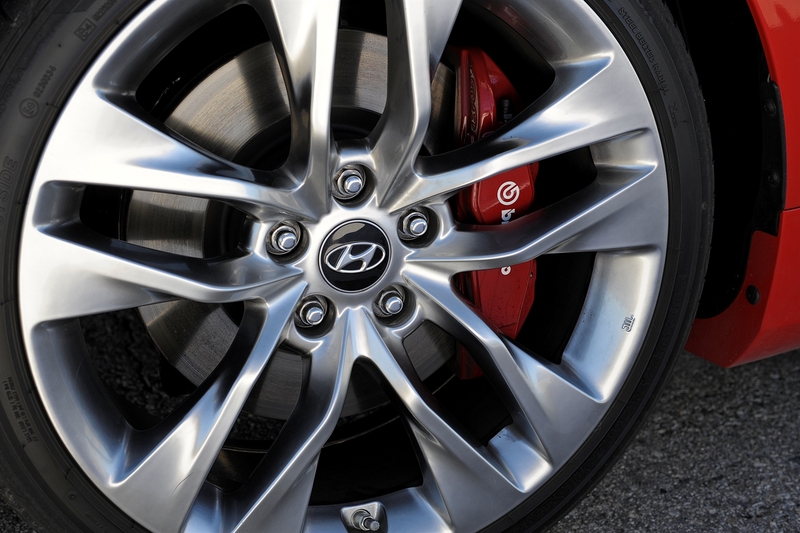 Braking is fine from four wheel discs, and ABS and stability control are standard. Inside, the Genesis Coupe’s cozy cockpit is well styled with everything not only looking good, but being well placed for ease of use. These are attractive, well laid out controls that add to your driving experience, but making it simpler to drive, not fiddle with a billion buttons. The silver test car featured a black textured dash and doors with gray leather feel inserts. The bucket seats were gray leather trimmed with black and gray mesh cloth for the seats’ main cushions. These were firm, well formed and comfortable. They also were powered, except the seat back angle, and included a power lumbar support. I like the brushed metal trim on the door handles and releases and on parts of the center stack and bottom of the tilt/telescope steering wheel’s hub. The blue rings in the main gauges and on the stack’s buttons is classy, and the cool metal look trim around three gauges mid-stack to tell you our MPG at the moment, turbo boost and oil temp adds a racy touch. In old-school muscle cars these, along with the tach, were often atop the dash or over the steering column. Naturally there’s a screen atop the stack, and it includes both navigation and a touchscreen for selecting radio channels, including satellite radio. There are ipod and USB hookups behind a small door at the stack’s bottom. All buttons and knobs are good sized and everything is easy to see, read and figure out. Brilliant! I also like the power window and mirror buttons built smoothly into the driver’s door and located by the door release. Great placement! The four dash air vents are well placed too and it was plenty steamy when I drove this, so I had the fan cranked. Air movement was good to my head and upper body. Overhead is a power sunroof and shade, plus the car has solid visors that flip to the side and include an extender to block side sun. There also are blueLink and HomeLink buttons on the rearview mirror, both standard. HomeLink allows you to turn on and off lights in your home or garage if you have a receiver there. BlueLink is a communications system similar to OnStar to allow you to ask for directions, or help, or also make phone calls or send voice text messages. One note here, it’s easy to bump one of the blueLink buttons with your hand as you adjust the rearview mirror. All these are nice features to have on a car at this price. Not so nice was my gas mileage. I got a disappointing 22.8 mpg in about 60% highway driving, surprising since this coupe is rated 20 mpg city and 31 highway. Plus, Genesis prefers premium gas if you’re going to get the full power from its turbo system. Certainly I had a few issues here, but overall the Genesis is a fun drive and a great looking car. If power is your main focus, go for the V6. If economy dictates your budget, go the entry-level route with a manual transmission. That could help you eek out a bit better gas mileage too, if you’re a consistent short-shifter. One thing is certain, there is not a better looking coupe on the market anywhere near this price. 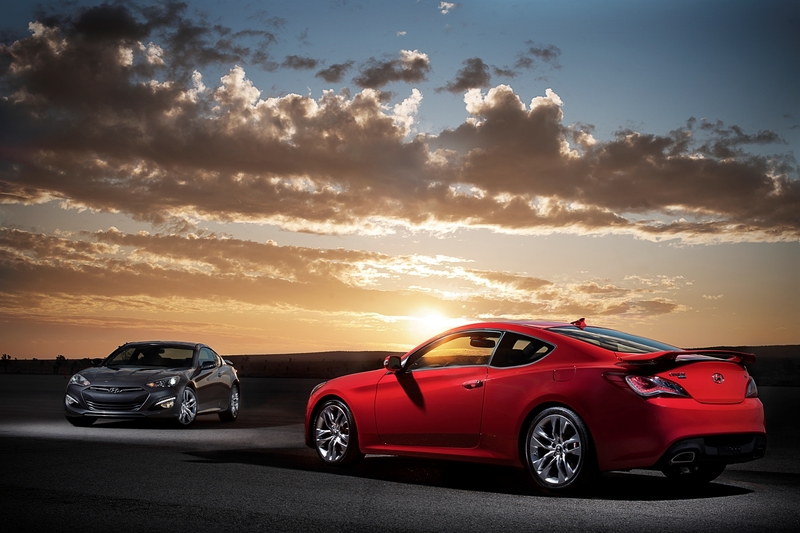 The Genesis Coupe comes with sporty looking wheels that add to the car’s overall styling power. Hits: Fast looking sports coupe with plenty of top-end power due to turbo and good handling and ride. Great interior look and functionality, attractive gauges, well shaped seats and attractive pricing. Misses: Prefers to drink premium for full power rating and steering feels artificially heavy. Turbo also doesn’t kick in early enough to make it more fun in city driving. Gas mileage was disappointing and shifts were too frequent and too noticeable.